Almost $120,000 was “misappropriated” from the industry representative body Tourism Central Australia, which receives most of its funding from the NT Government, some time since 2010. This was revealed in the organisation’s annual report delivered to members at the AGM this week. The annual report, prepared by general manager Jaclyn Thorne (pictured above, right), says a police investigation is now under way, but gave no explanation why the apparent theft had not been discovered before except to say “it was the 2014/15 Financial Year when the suspected issue ‘crystallized’ into a proven misappropriation. Chairman Dave Batic (at left) said: “It was through the skills-based TCA Executive Committee that identified an issue with the Supplier Funds account in the Balance Sheet in February 2015. “This issue was immediately raised with Deloitte, our audit partner, and subsequently in October 2015 an independent forensic accounting investigation was undertaken. “Through this process, it was uncovered that funds had been misappropriated as far back as 2010 and up until mid-2015,” Mr Batic said. Tourism CA in 2014-15 had revenue of $1.2m of which $765,000 came from the government’s Tourism NT. Other government grants were $17,000 for the Art Trail Project, $5,364 for a grant writing workshop, $40,000 received for visitor centre refurbishment and $15,000 for the Andrew McEvoy Project 2014. Fees from the 327 members raised $89,044, up from $80,238 the year before. Mr Batic said in his report: “Our industry is buoyant, innovative and resilient which has been demonstrated in the past decade when visitation has been in decline. 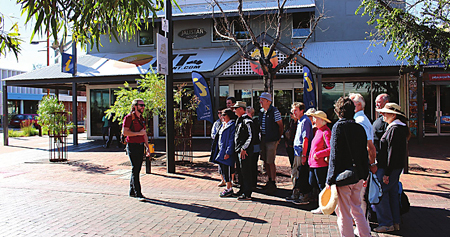 Despite a 7% decline in the foot traffic at the visitors centre (at left), now in Todd Mall, which “welcomes over 115,000 people each year … staff managed to increase tour bookings and retail sales. “In fact the retail offering grew 46% from 2013/14 to 2014/15 which can be attributed to staff training, retail consultancy and customer service measures implemented,” says Mr Batic. Promotions included the Central Australian Characters Campaign 2014: “This intra-territory campaign featured 14 characters over a nine month period on television, radio and in print discussing their love for Central Australia and encouraging both locals and visitors to ‘discover’ the region,” says the report. @2 – And yet it is reported today that TCA members requested information be gathered about changing auditors, which is to be provided at a meeting tonight. Sounds like they think the auditors should have identified the anomaly much sooner than it was? @ Morgan and Phil: Thank you, comments much appreciated. Evelyne, an audit is designed to pick up errors in financial reporting. Fraud by its very nature is a deception not an error. Audits are not designed to pick up fraud, this would add enormous cost to the audit. The matter is currently with the Police for investigation so comment is limited, Evelyne. There’ll be more revealed as the the investigation continues. We’ll keep you posted. Does it means that for five years the accounts were not audited? An auditor is supposed to go through bookkeeper records, creditor records and tax records to find any errors and determine how to correct them.